The rugged wildness of the Sawtooth Valley is a powerful seduction. The natural raw beauty of the Sawtooth and White Cloud Mountains has a show-stopping effect on all of us. The Salmon River makes its grand entrance near Galena Summit shaping the landscape while spreading its cheer throughout the valley to wildflowers, wildlife and wild rafting adventures. But the megastars of the Sawtooth Valley come out when the sun and moon set behind the jagged peaks of the Sawtooth Mountains and the glow of the last light fades into darkness. Now the greatest show on earth begins! The Central Idaho Dark Sky Reserve comes alive to entertain you all night long. So spread out your blanket, grab your star chart and enjoy the extravaganza. In December 2017, the Central Idaho Dark Sky Reserve became the United States’ first International Dark Sky Reserve. Can you believe there are only 11 others in the world? The International Dark-Sky Association designated 1,416 square miles to be protected and preserved for scientific, natural, educational, cultural, heritage protection and public enjoyment. The reserve includes the communities of Ketchum, Sun Valley, Smiley Creek and Stanley plus the Sawtooth National Recreation Area. The rugged terrain in central Idaho prevents infrastructure development creating one of the only places in the lower 48 states to truly have an off-grid adventure. Light pollution is virtually non-existent here. And that is a BIG deal since skyglow blocks 99 percent of Americans from experiencing a natural night. Can you see the stars from your backyard? What does all this mean? An unrivaled pristine night sky in Stanley that will blow your mind! You can experience the wonders of our galaxy through your naked eye without the distraction of light pollution in a protected and preserved area. Let’s all rejoice in the Central Idaho Dark Sky Reserve! Attend the educational summer events focusing on the dark skies that are so spectacular, they will have you seeing stars. The Stanley-Sawtooth Chamber of Commerce has teamed up with the Boise Astronomical Society(BAS) to bring you a Dark Sky Reserve Celebration. On June 15 and 16, get ready to be mesmerized by the magical star-studded skies above a Sawtooth Mountain silhouette. A public star party and a laser-pointer constellation tour will take place at the Stanley Pioneer Park. Stay connected to the chamber’s website for more details. The Sawtooth Interpretive and Historical Association has incorporated the dark sky into two of their Forum & Lecture Series. They will also be hosting night sky viewing parties at the Museum around the New Moon phases each month. Did you know the 2018 Perseid Meteor Shower will occur between July 17 and August 24? 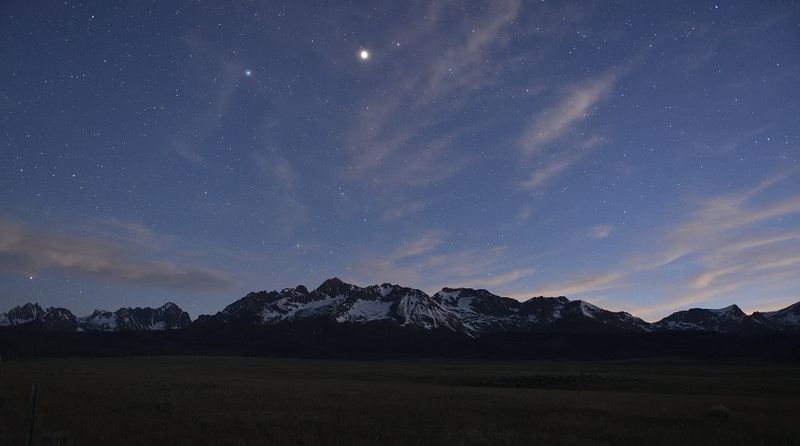 If you’re in the Sawtooth Valley, this is your chance to wish upon 40 – 80 shooting stars per hour. At least one of them will come true! Choose your camping spot anywhere in the backcountry and the stars will find you. Park Creek Overlook: the night sky lights up brighter than a planetarium. Nip and Tuck and 4th of July Roads: dirt roads off the beaten path provide star-gazers with solitude and serenity. Boat Box or Sunbeam Hot Springs: what’s more perfect than a soak and stars? Redfish, Stanley, Petit and Alturas Lakes: you love them during the day; experience these lakes in all their nighttime glory. Stanley Pioneer Park: find your Zen on the playground amongst billions of stars. For those who have lost sight of the stars, come to Stanley where the constellations, planets, meteors, comets and Milky Way will guide your mind to a peaceful state of being.